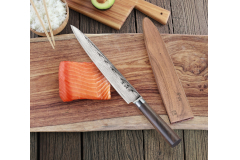 Each knife in the J Series features African Blackwood handles and a unique Damascus pattern across the face of the Japanese VG10 steel blade. 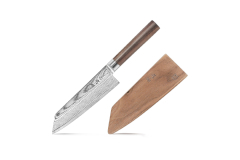 A dark walnut wood magnetic Saya style sheath if provided for each knife in the J Series. 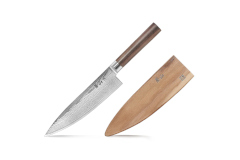 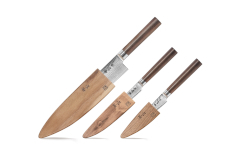 The sheath is perfectly shaped to match and protect the knife's distinct blade.The J Series includes 3 sizes of Sashimi knives as well as Kiritsuke, Chef and Santoku.